Have you ever heard of a cat that likes to swim? My cat likes to play with the faucets and dip her paws in the water dish, but I don’t think she would actually take a dip in a pool like a Turkish Van Cat would. 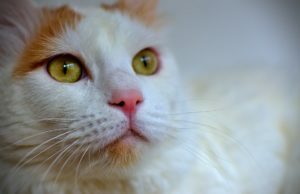 What’s the backstory on the Turkish Van Cat? Legend has it that Turkish Vans were on Noah’s ark but eventually they ditched it and swam ashore in Turkey near Lake Van. Known as a cold and mountainous region, it would explain their cashmere-like coat and muscular build. Today they are considered a national treasure in Turkey where their preservation is overseen. They made it to Europe in the 1950’s and eventually, during the 1980’s, made their way to the United States where they were recognized as a breed by the International Cat Association. Traditional Turkish Vans range from 10 to 18 pounds and are mostly white with orange colored ringed tails and markings on their heads and sometimes their back. If they do have a distinctive mark on their back it is known as the thumbprint of God, or in the Islamic version, the thumbprint of Allah. Jewish and Islamic traditions say that the divine touch gave them their orange markings. It’s also said that while on Noah’s ark their tail was slammed in a door, which gave it its coloring. They have semi-longhaired silky coats, that are comparable to cashmere, which cannot be tangled so weekly grooming is more than enough. They also shed pretty lightly compared to other breeds of cats. They are commonly known for their distinctive eyes and colors which is either blue or bright gold. Many have one blue eye and one gold eye. It’s also said that you can tell how a Turkish Van is feeling by the color of their nose. If it’s pink they are fine, but if it turns red they are upset, and the redder it is the more upset they are. What’s the deal with their desire to swim? Known as swimming cats, it’s in their nature to play in water and depends on the cat how involved with water they will be. I’ve watched YouTube videos of them swimming in lakes and swimming pool as well as dipping their paws in water dishes and learning to turn on faucets. If you own one I would recommend keeping your toilet seat down and covering pools and spas to keep them out of trouble. Definitely supervise them if there is a possibility of drowning—although they can swim. They even have water-resistant coats. Turkish Vans are affectionate and usually bonds strongly with just a couple of people in the household. They will chose to spend most of their time with said people by following them around and sleeping beside them. However, they are not cuddly lap cats. They are known to be very active, even when seniors, and are great climbers who can usually be found on the highest point in the room. They are not known for their grace so keep breakables out of their reach. It’s best to provide them with plenty of climbing opportunities like tall cat towers or climbing shelves. They are also extremely intelligent and can learn tricks very easily. They like to play challenging puzzles and games. They are often compared to dogs because of their intelligence, love of learning tricks, walking on leashes, and their talkative nature. Turkish Vans generally have a lifespan of 12 to 17 years and are a pretty healthy breed. They can suffer from hypertrophic cardiomyopathy which is a condition that makes it hard for the heart to pump blood. They also tend to suffer from car sickness so they are not recommended for people who like to travel with their pets. Their energetic nature makes them a great pet for kids and they get along well with other cats as well as dogs—if introduced properly. 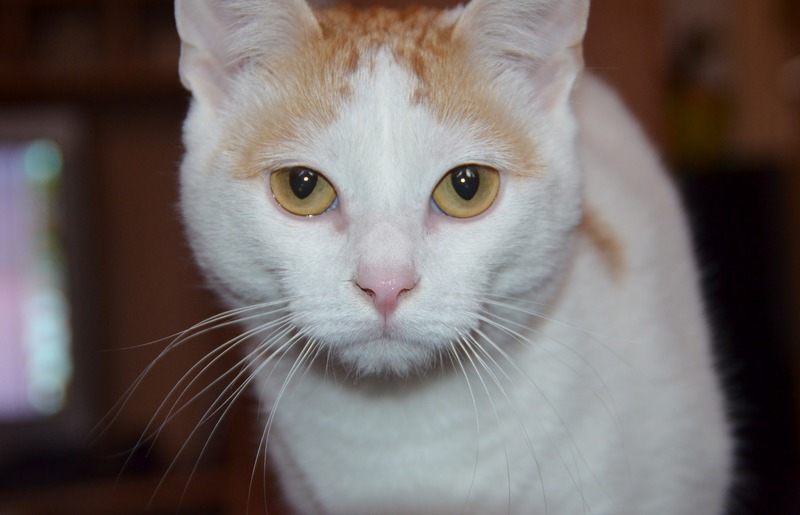 If you’re looking for a semi-large cat that loves to swim and has a ton of energy then the Turkish Van is definitely that cat for you.